A lot of action is happening in Technopark these days. This week, to be more exact. Two of Kerala's leading IT firms, both based at Technopark, have unveiled ambitious growth plans which will propel them into the big league. 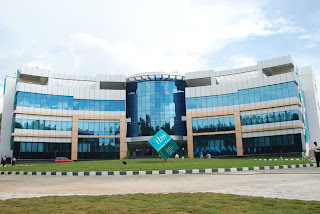 IBS has inaugurated the first phase of its 450,000 sq.ft campus in Technopark Phase I. The campus will be complete by 2009 and employ 4,500 professionals. 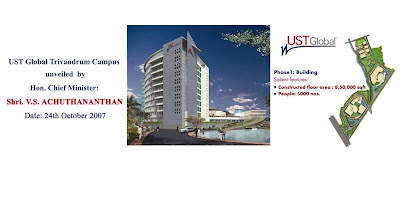 Just a couple of days later, UST Global has launched work on its 10,000 seater campus at Technopark Phase II. The first phase with a built-up space of six-lakh sq.ft and a capacity to accommodate 5,000 professionals, would be ready within 12 months. The investment plan for the first phase was about $ 60 million (about Rs. 240 crore). The second phase to be completed by 2010 would have a built-up area of four-lakh sq.ft and a seating capacity for 3,000 professionals. The proposed investment plan for the second phase was $ 40 million (about Rs. 160 crore). Finally, the third phase had been designed to have a seating capacity for 2,000 professionals and it would have a built-up area of three-lakh square feet. The software development area alone totals a whopping 1.3 million square feet, the overall campus could have a built-up area of close to 2 million square feet, when ancillary areas are also factored in! The first phase is a behemoth with a total of 1 million sq.ft of built-up area, with about 14 floors at 70 m tall. Its yawning atrium is said to span a football field while the building's footprint extends over 5 acres! It will overtake the 850,000 sq.ft. Thejaswini as the largest IT building in Kerala and will be one of the largest single buildings in India. Well, that is about 2.5 million sq.ft launched in the span of a week, but the good news does not stop there. Work has finally begun on the signature campus of Infosys. The 1-1.5 million sq.ft campus, designed by Hafeez Contractor, will seat 8-10,000 professionals and be completely finished by 2010. The first phase of 400,000 sq.ft is expected to be complete by end-2008. Closeby, at Phase I, Infosys' arch-rival and India's largest software firm, TCS, is reported to be ready to commence work on its massive development centre by December 2007. The centre, the first in Kerala, will have over 1 million sq.ft of built-up area. So it's raining campuses in Technopark, now if only the Government were one-tenth as active. The acquisition of the 100 acres of Technopark Phase III is expected to be complete by December as is the first 200-250 acres of Phase IV - Technocity. These have been pending for years now, and we can only hope that the burst of activity from the IT majors will spur, if not shame, the netas and babus into action! I have often been told, sometimes by readers of this blog, that the "who's who in IT are already in Cochin". Well, I guess they mean TCS, Wipro and CTS - although 3 out of the 15-odd Indian and MNC majors in India is a long way from "the who's who already being in Cochin". Of the these, only small operations - less than 500 personnel apiece - are in place. Only Wipro has shown signs of expansion, with an 8000-seater campus by 2010-11. On the contrary, TCS is now getting ready to commence construction of an ODC in Trivandrum instead. In Trivandrum, all the majors - Infosys, TCS, UST Global and IBS - have started work on their own campuses, as I have detailed here. I sympathise with those who choose to ignore reality, they have a serious malady indeed! It is blindingly obvious that actions speak louder than words. Whereas the projects in Trivandrum are already being built and occupied, elsewhere all those countless "millions of sq.ft" are still on the drawing board, if at all, despite years of relentless crowing. On the website of Technopark, it is mentioned that about 3.2 million sq.ft of space has been completed and occupied, and that another 2 million sq.ft are under development, not even including Phase II. On the other hand, the Infopark, Cochin site mentions that "it plans to have 1.7 million sq.ft" without mentioning much about the actual space as of today. The creative use of the words "plan, expect, confident, will happen, in another 10 years" and so on - an integral part of any confidence trickster's repertoire , are the cornerstones of most news reports coming out of our neighbour by the Vembanad Lake. The saddest bit is not that such media reports come out in a most media-aware of States, but that so many of our enlightened citizens fall hook, line and sinker for all this.